Since February 2008, oenophiles, wine distributors and merchants from all corners of the globe have flocked to our humble city, popping their corks for one highly attractive factor: the nixed wine tax. Sales have skyrocketed, and little wine bistros and shops have sprung up across the city like grapes on a flourishing vine. It’s hardly a surprise, then, that the popular Parisian establishment Le Quinze Vins sought Hong Kong for its very first overseas location. The original French hole-in-the-wall is a staple for wine lovers, featuring an overwhelming list of French labels as well as serving traditional cheese and cold cut platters and steak frites, among other wine-heightened nibbles. 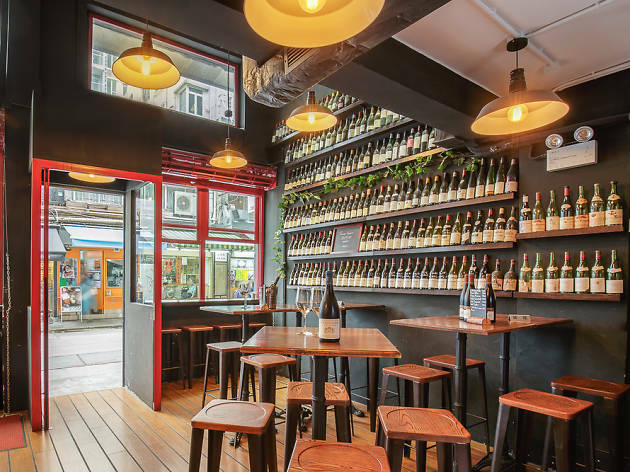 The new Hong Kong sister shop and bar, on the quaint lane that is Swatow Street in Wan Chai, operates in much the same way, boasting a simultaneously modern and classic façade, bolstered by rich accents of red – that reminds us of the hue of a well-developed pinot noir. The brasserie-esque furnishing invites both parties of close friends and couples, and seats around 40. The cluster of staff is small, genial and intimate with the wine. We spot Hugues Rondouin, co-founder of the original Paris bar, inviting in friends old and new (Rondouin is on the ground opening the branch with the support of local staff) – and it is positively jammed on a Friday! 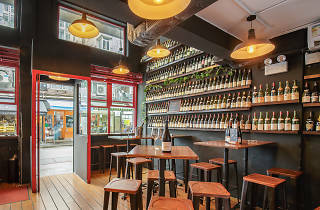 It’s no wonder as the bar is the perfect remedy for an ever-growing consumer demand for French wine in the city. We try a merlot and a viognier ($55 each), recommended by bar staff from the specials board – both are flawless. The red exceptionally so in its aerated silky tannins, so we seek out the comprehensive menu list of wines in stock. Most wines are by the bottle, not glass, for example, Chiroubles VV Domaine Marrans 2011 costs $300 and a Pomerol Chateau La Conseillante 1976 is $2,220. The range is vast – from sprawling vineries to smaller, independents in France. There’s a grape, season and flavour to suit every palate, whether you’re an aficionado or an amateur. Concentrations on Burgundy and Languedoc regions (among others) fill the pages. There are also champagnes and platters of ham and cheese to accompany your quaffing. As far as cosy, authentic wine bars go, Le Quinze Vins knocks it out of the park, and there’s little to fault. It’s almost as if the owners transported a European space – a tried and tested formula – into Wan Chai. A smart move considering the wine market here.